Green Beret (also known as Rush N Attack - a really bad play on words!) 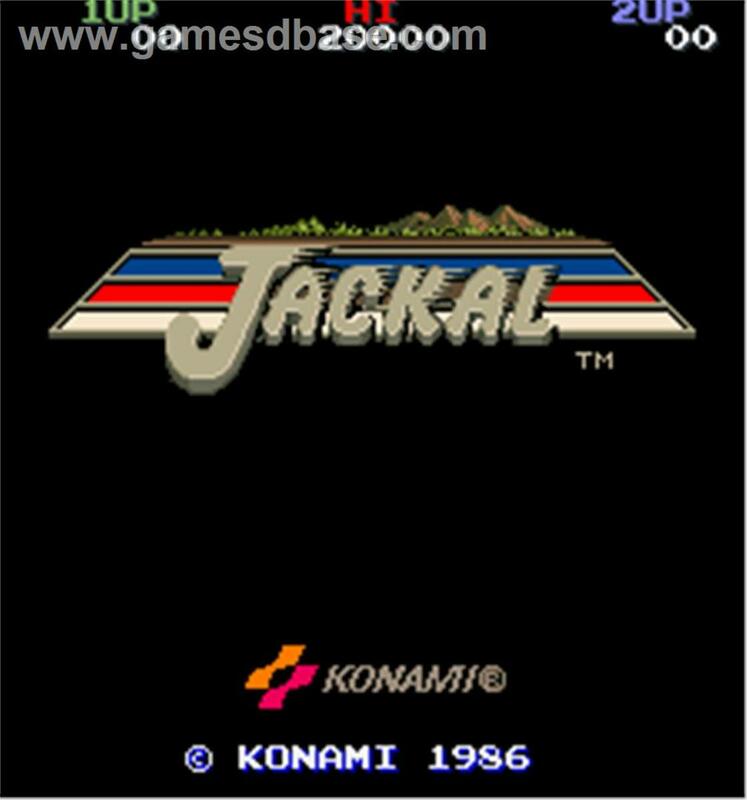 was a side scrolling vertical arcade game released in 1985 by gaming giants Konami. 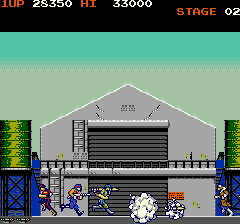 It combined one-way scrolling with classic platform action against the backdrop of the cold war era to create a very playable run 'n gun game. This game was a little different to the standard shoot em up fayre due to having the title character mostly use a knife to dispatch enemies - making it probably the first ever 'stab em up' arcade game. This was a firm favourite of mine back in the 1980s and is one that ate a vast amount of loose change I can tell you. The player plays as the title character, the 'Green Beret' and must infiltrate an enemy military base to save several prisoners therein. 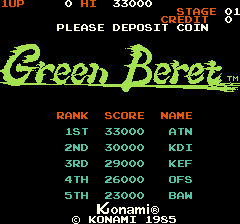 Armed with the famous 'Green Beret Knife' (which the player keeps for one hundred percent of the game) the player had to 'hack' his way through each level, taking on enemy soldiers of varying types. I have to say I always thought it was a bit rough sending only one man armed with a knife into such hostile territory on a rescue operation, but hey ho! 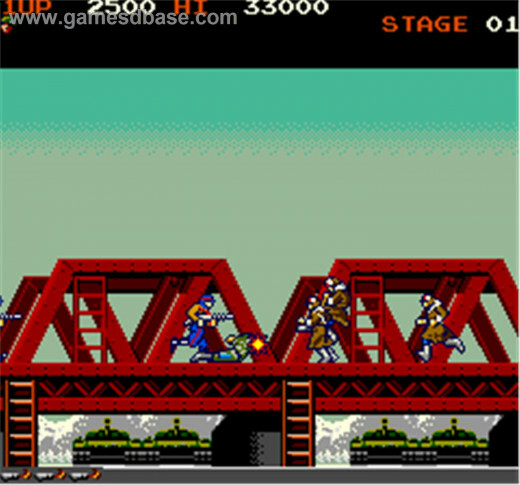 The screen moved from right to left in a push-scroll as your soldier made his way through each level, with the screen only scrolling in one direction. There were various types of soldiers to take out; some were armed with sub-machine guns, others were martial arts experts who would take you out with a flying kick if you let them get too close, others would parachute in from the top of the screen and some would man mortar emplacements. A commandant soldier would appear at certain points on each level. Killing him yielded a limited shot power up which varied depending on which stage of the game you were currently at. These weapons would come in extremely handy. I always used to use them to take out land mines and mortar emplacements. It was easier than trying to jump the mines, and taking out the emplacements from range was great fun. 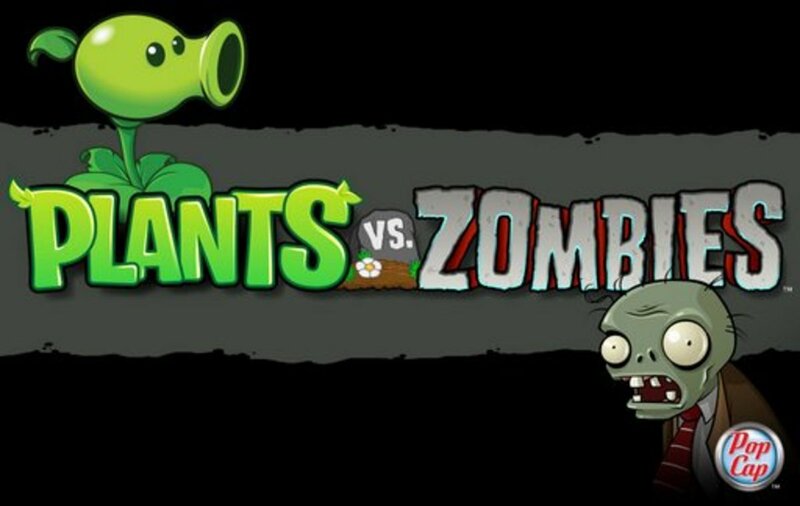 The end of each stage put you in a fight against numerous enemies. For example at the end of the first level a truck would pull up and around thirty soldiers would pour out of the back and run towards you. On other levels you would come up against attack dogs (and their handlers), soldiers in gyroscopes and even soldiers armed with flame throwers. It was always wise to try to keep your special weapon for these end of level battles. It was possible to stay in one place and continually take out enemy soldiers (as there were always on-screen bad guys no matter how many you kill) to increase your score. 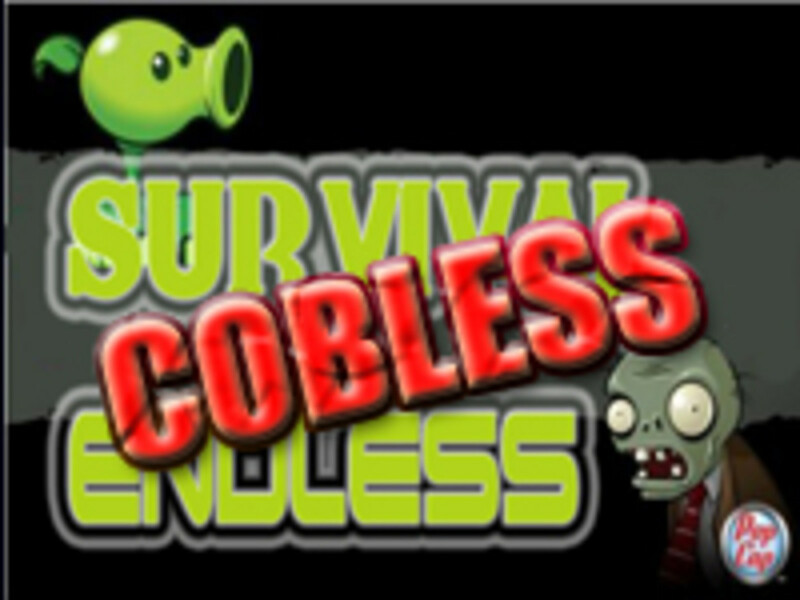 However, there was a 'time limit' which was not displayed to the player which meant that the game would increase in difficulty if you did stick around in one place for too long. 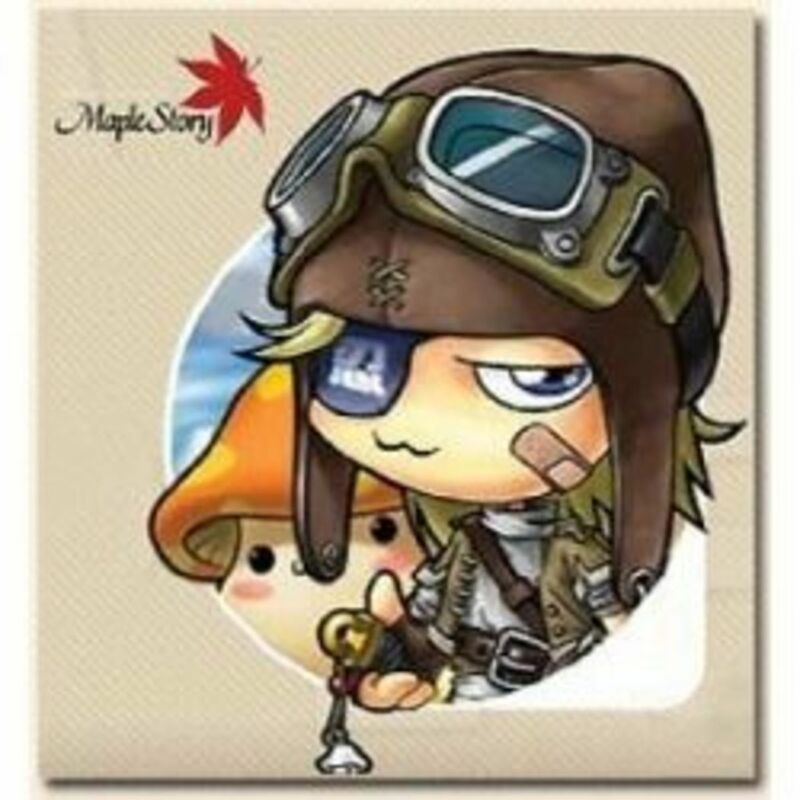 If you took too much time then the difficulty really increased and eventually a bomber would appear to blow you into pieces! This game was a pretty big hit for Konami and ended up being converted to pretty much every home computer and console of the era. The 8-Bit machines such as the Amstrad CPC 464, Commodore 64 and ZX Spectrum were treated to good conversions of the game. The ZX Spectrum version is one of my all time favourite games - no doubt down to the fact that it was coded by the legendary and sadly no longer with us, Jonathan Smith. This is a game I still return to from time to time. It is by no means easy, but once you get the hang of it, it is quite beatable. A land-fill of vintage tech! It's Gaming! And It's Online! Space Invaders arcade game. What more needs to be said? Any Fans Of Green Beret / Rush N Attack? Being an '80s action fanatic, I had to seek this one out and play it; a very fun game. I'd pretend that its a prequel to the Rambo films. Hi jasmineeden - thanks for the comments. This was a great game - you should try and play it again on MAME or even try the ZX Spectrum version. Hi Roly, yes it is indeed a classic game. The Spectrum conversion was really great; it captured the feel of the arcade original as well as you could expect on the machine. 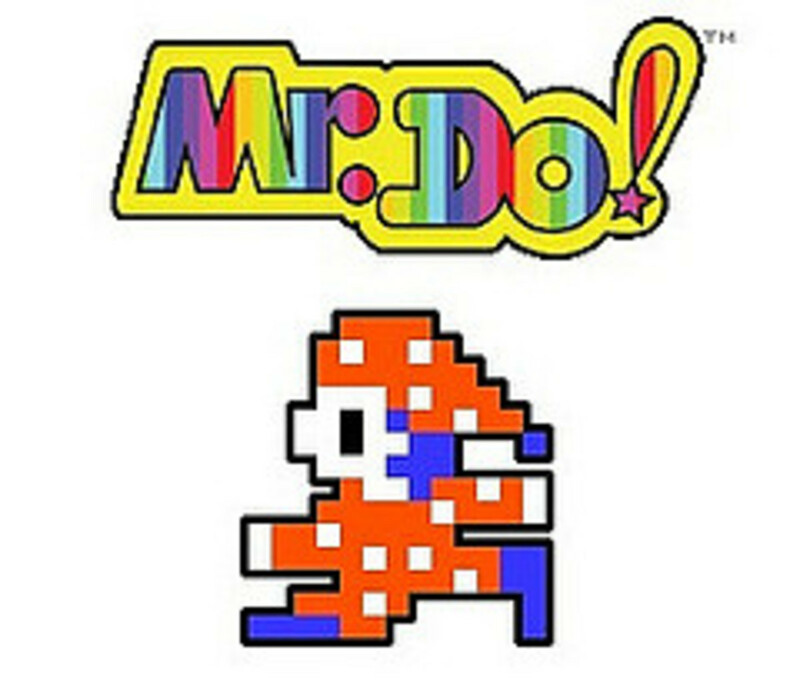 Another classic, I played this in the arcade as well as on the Spectrum. The latter's monochrome screen did not detract from the game, it was a really good conversion.